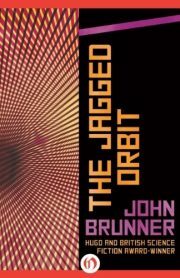 1969’s The Jagged Orbit is the second novel in John Brunner’s dystopian quartet. This is not my favourite of the four books, but (when I chose it) it seemed thematically appropriate for this ugly week. 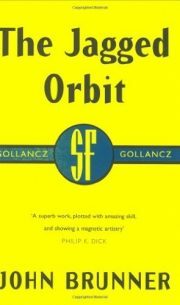 Where Stand on Zanzibar was about the consequences of population growth, The Sheep Look Up about unchecked pollution, and The Shockwave Rider about Future Shock, The Jagged Orbit concerns itself with racial divisions, paranoia, and violence dialed up to eleven. The racial divisions of the 1960s were left unchecked. By the 1980s, they had escalated into open race war. By the 2010s, America is divided into two camps: knee (African American) enclaves, surrounded by vast blank (white) dominated regions. The simmering race war occasionally flares into open battle. As a result, everyone in both armed camps is well armed and alert for any sign of trouble. It’s a great time to be a massive international arms dealer like the Gottschalks! And not by coincidence, because the Gottschalks have invested a lot of time and effort convincing Americans to hate and distrust each other, particularly people who are visibly different. It is rather providential for the arms company that humans are so very good at xenophobia. Things are only going to get better, because the arrival of a foreign activist/terrorist in America could not be better timed to inflame blank fear just in time for the impending roll-out of the company’s brand new System C. System C will be yuge! Yuge! If only the Gottschalks were the protagonists…. Inadvertently triggering the end of human civilization could very well have a negative impact on Gottschalk’s profits! Although not without its points of interest, this is the weakest novel of Brunner’s quartet (for a number of reasons). 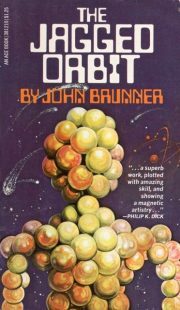 Perhaps the most significant of these is that it seems like Brunner has a very clear idea of where he wants to begin, with a vision of 21st America that makes the Long, Hot Summer of 1967 look positively utopian by comparison. He knows where he wants the novel end up. The method he uses to get there, however, is an unconvincing deus ex machina, as though he couldn’t imagine a plausible way out of the trap he built for the characters. 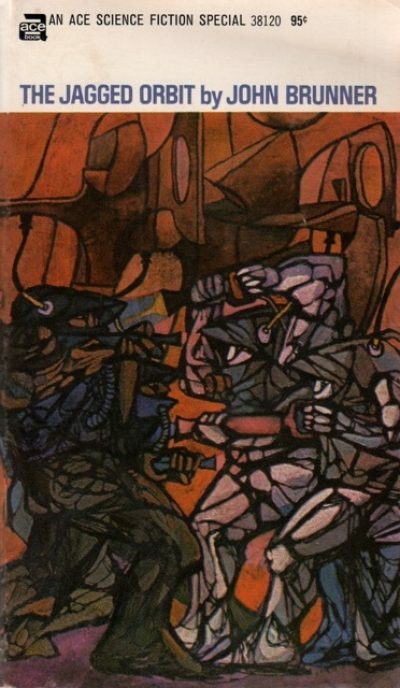 I was also not crazy about Brunner’s re-use of the intertwined strands of narrative, seen in Stand on Zanzibar and borrowed from Dos Passos’ American Quartet. For some reason, that style drew me into Stand, but it irritated me in Jagged. I found it hard to immerse myself in the book. Mind you, it could also be due to current events (week of June 12-18 ). A book that featured horrific hate crimes (and those who would capitalize on them for political advantage) turned out to be just too timely to be pleasant. I should have picked another book. Although given the monotonous regularity of mass murders in the US, that would have meant never reviewing this book at all and I did want to review it at some point. But there’s one worldbuilding detail that pleases me. You’ll notice I called Flamen a blogger. Spoolpigeons are not quite bloggers as we imagine them. While Brunner does imagine a heavily wired world, he cannot quite escape the conceptual blinkers of the pre-web world. His is a world still dominated by a handful of communications networks and centralized computers; Flamen is dependent on the support of one of the media giants to gain access to his audience. Still, it’s a prescient detail and one of the reasons that many people see this book as proto-cyberpunk. It would be nice to say the idea of intentionally inflaming social divisions to exploit fear and anxiety for personal profit was in any way a bold, original idea but of course, it’s one that Brunner would have known all too well. Not only did the UK have its own shouty men ranting about those darn immigrants, Brunner lived through a certain recent unpleasantness whose origins lay in willfully exploited paranoia and mass stupidity. The particular divisions being exploited today are different1 but the processes and the general effect is much the same. Encouraging people to hate and fear one another is still a very useful tool, both for those who seek personal power and those who simply wish to sell people the means to kill one another. Despite my reservations, this book is as timely now as it was back in 1969. Just don’t count on a helpful time traveller to come save the day. 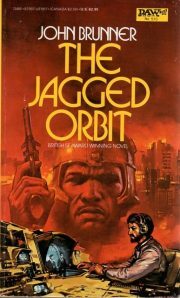 The Jagged Orbit is available from both Open Road Media and SF Gateway. 1: One significant difference is that Brunner’s 2014 America is much more violent than the real one. Even with mass murder an almost daily reality in the US, the overall murder rate has been declining since the 1990s. Obviously, a lot of people are aware of that fact, because a lot of effort has been poured into keeping people scared and easily manipulated.